Enjoy classic Yankee Candle fragrance with this set of 5 sentiment jars. Each jar has a lovely sentiment on the front, featuring a brushed metal lid, this regular 2-wick tumbler candle makes a perfect gift for any occasion. A Warm House Makes A Glowing Home, featuring the scent of Fluffy Towels. The fresh scent of clean towels warm from the dryer with notes of lemon, apple, lavender and lily. Positively Glowing. From the Inside Out, featuring the scent of Lavender Vanilla. An oasis of tranquility… the perfect mix of fresh lavender and warm vanilla with musk and bergamot. Shine Brighter, featuring the scent of Sun & Sand. A tropical beach breeze of sweet orange flower, lemony citrus, fresh lavender and powdery musk. Sparkle, Twinkle, Hugs, Thanks, featuring the scent of Meadow Showers. Daydreaming of a quiet escape...the naturally tranquil and airy scent of fresh raindrops on blades of green grass. 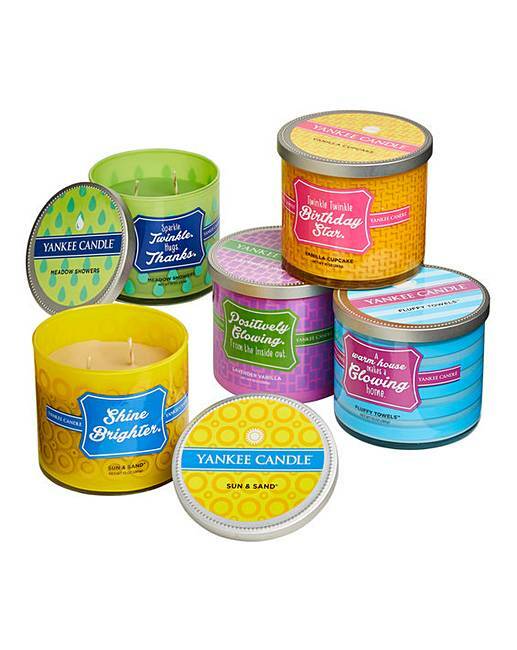 Twinkle Twinkle Birthday Star, featuring the scent of Vanilla Cupcake - The rich, creamy aroma of vanilla cupcakes with hints of lemon and lots of buttery icing. Each had a burn time of up to 40 hours.